Chair of Mid Ulster District Council, Councillor Kim Ashton, is pictured with Harry Henry, Contracts Director, Henry Brothers and Alan Mitchell, Commercial Director, Henry Brothers, ahead of next month's 'Meet The Buyer' event for local companies interested in supply chain opportunities in the construction of the new Northern Ireland Fire & Rescue Service (NIFRS) Learning and Development Centre at Desertcreat. 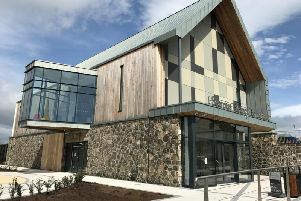 Local businesses have the opportunity next month to explore how they can tap into the £4M contract to build the new Northern Ireland Fire & Rescue Service (NIFRS) Learning and Development Centre at Desertcreat. Businesses will have the opportunity to meet with representatives from Henry Bros, on June 25, discuss the opportunities to form part of the contract supply chain and register their interest. Encouraging local companies to attend, Chair of the Council, Councillor Kim Ashton said: “This is a major contract won by a Magherafelt-based company which is now keen to ensure that other businesses in Mid Ulster and the wider economy can also benefit. The ‘Meet the Buyer’ event takes place on Monday, June 25 from 12noon to 7pm at the Glenavon House Hotel, Cookstown.